At Whole Family Health Clinic, we offer state-of-the-art pulsed electromagnetic frequency (PEMF) treatment sessions to address a range of health conditions, and also to help our clients improve overall health or to simply achieve optimum performance. PEMF works by stimulating and resetting the bodies natural frequencies by creating an artificial field that has the same frequency as the Schumann resonance. 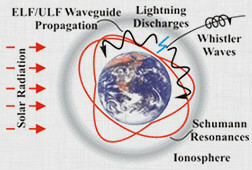 The Schumann resonance is the natural electromagnetic frequency of the Earth (7.8 Hertz is the strongest frequency, but there are other resonances) and is created by a combination of electrical discharges across the globe and the specific shape of the Earth and the height of the ionosphere. Humans have evolved with these frequencies and they are necessary signals for our heath. Modern life generally does not allow our bodies to experience the natural frequencies of the earth and we are usually overexposed to unnatural frequencies which can have negative effects. Exposure to the earth frequencies ( which range from .5- 33hertz) has been shown to have many positive effects upon the body. It has been shown to relieve stress, induce alpha and theta brain wave frequencies, stimulate bone growth, accelerate recovery from pain, aid in wound repair, benefit circulation and sleep, increase nutrient uptake, metabolism, detoxification rates and more. Our office is located on the second floor of the Abbey House (Suite 106) at 2928 SE Hawthorne in Portland, Oregon. If you have any questions, you may call our office at 503-460-0630. Click here for our recommended doTerra essential oils.